Denne perfekte Gulf-Beach tilbaketrekning like sør for Siesta Key ligger på et lite stykke paradis kjent som Casey Key. Et intimt, vennlig sted å slappe av, slappe av og se på lek av delfiner, manater, pelikaner og en rekke shorebirds. Du vil sole seg i de enkle gledene til øya livet, eller rush av Sarasota rike kulturelle samfunnet som ligger bare noen minutter unna. Ta en uforglemmelig søndagstasjon langs Casey Key Road, og du vil se noen av Sarasota mest luksuriøse hjem. De vridete kurver og lett trafikk gir også en flott sykkeltur. Casa Cay enhet 3 er en lavere nivå effektivitet med et utendørs sitteområde for morgenkaffe eller kvelds cocktailer. Vi tilbyr også et sjarmerende to soverom strandhus og et øvre nivå effektivitet. Lei en eller alle tre, og ferie med hele gruppen eller familien. For mer informasjon besøk casacay nettsiden eller ring 941-234-4445. Alle enhetene har fullt utstyrte kjøkken. This is my fifth month long stay. As usual I loved it. Nice surroundings. Owner took care of any request I had. I hated to leave. We wanted to spend a month in Florida and we found this little gem on VRBO. We weren't sure how it would go, site unseen. But as soon as we arrived and saw the immaculately clean studio and the beach only steps away, we immediately booked for next year! Internet was spotty but hey, we enjoyed the break. DVR didn't work but was replaced in literally 2 hours. We loved our stay here and will come back for sure! Thank you for your review. We want our guests to relax and enjoy our little piece of Paradise. We strive to meet their needs and expectations. Casa Cay is good for a quiet get away on the beach. entertainment and restaurants only a short walk or drive. We are very proud of our units and grounds. We work hard to keep them clean and pleasant for relaxation. We had a wonderful time during our stay at Casa Cay. We stayed in Unit 3. It was more spacious than I expected and I was impressed with how clean it was. Although it did not have a view of the gulf, the beach was only steps away and the unit had a private area with a table outside which got nice sun during the day. The complex also has a very nice sitting area on the beach side with a gas grill for guest use. The complex was nice and quiet and well maintained. We had the privilege of meeting the owner, Troy who was extremely nice and asked us a couple times if we needed anything. I love Casey Keys beach. It does not have as many people as Siesta and the shelling is great. Two good restaurants are within walking distance. Walked to Pop's for cocktails and appetizers. They have a golf cart that makes rounds in the evening and will pick you up on the other side of the bridge. Pelican Alley is the other restaurant, which was not open this visit as it was closed while they repair hurricane damage, but we have been there before and they have a wonderful seafood chowder. Would definitely visit again. Thank you for sharing your experience with us. We work hard to meet the needs of all of our guests by providing a clean, restful, and pleasing environment. 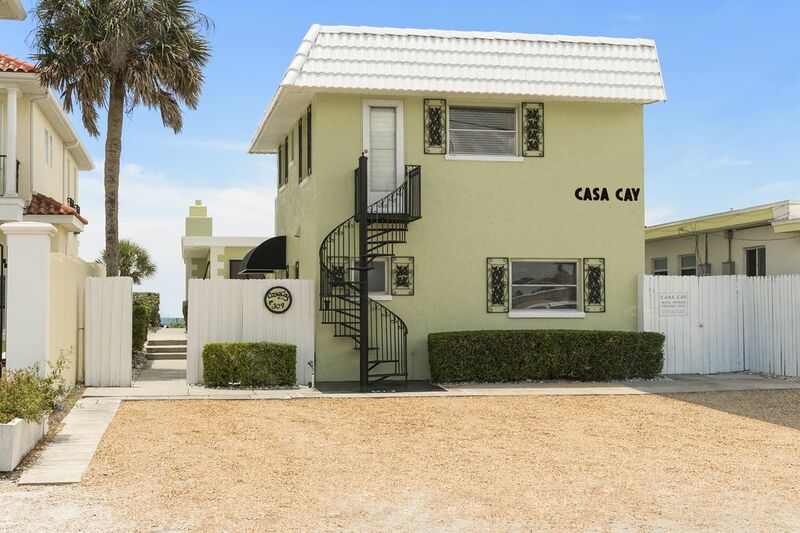 Very clean, great location, will definitely recommend to anyone traveling to Casey Key. Booking was easy, Karen is very “user friendly” and a pleasure to work with. Rachel was friendly, professional, and very responsive. Would not change a thing- cannot think of a thing that would have made my stay better. Two thumbs up!! Thank you so much for your review. We work very hard as a team to provide our guests with a relaxing peaceful stay. Many say it is perfect! A one-time cleaning fee of $75.00 is added to all bookings. Rates for Unit Three are for 2 people. Additional rate of $10.00 per Adult person, per night, is applicable (children sleep free -please do not include them in your count for number of people staying). Peak Season: Mid December to May (Saturday before Mother's Day) and all holidays Summer/Fall Season: May - December Pets welcome on monthly rentals only, $200 fee is applicable per pet. Immediate pick-up is required as grounds are shared with other guests. Check in after 4:00 p.m. Checkout time of 10:00 a.m Weekly rental periods are Saturday to Saturday unless prior arrangements have been made. Monthly Rental periods are from Saturday to Saturday including four full weeks per month (28 days).